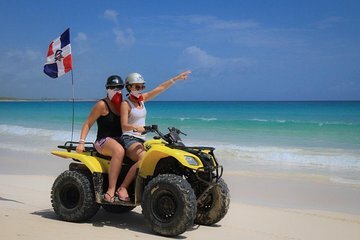 Go off the beaten path to an off-roading, four-wheeler, guided, adventure tour that takes you into nature and across beaches. Ride your ATV through a natural cave to see its underground river and rock formations and stop for photos as you ride the long shoreline of Macao Beach. At a local home, rest and relax while learning about locally produced goods like coffee and cacao. Beautiful and lots of fun experience! The flyer says is a 4hours activity, it is only 2. If you add the moment they pick you up at the hotel makes 4 hours. Other than that, Everything else is perfect. Ps. Bring a set of old clothes because you are going to get dirty with the dust and mud. Make sure your phone has service in DR.